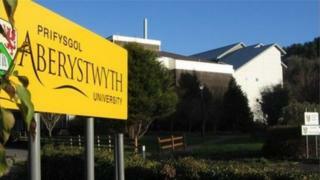 Staff at Aberystwyth University are facing potential job losses as it tries to make £11.4m of cuts by April 2019. The university has blamed increasing competition for students, rising costs, and Brexit uncertainty for needing to make the savings. Unison said the university had met with unions and it understood "that up to 150 jobs could be at risk" due to the scale of the savings required. The university said it wanted to avoid the need for compulsory redundancies. No departments would need to close under the savings plan. Based on its projected budget deficit, the university needs to make savings of £6m (5%) in 2017-18 and £5.4m (5%) in 2018-19. A statement issued by the university said it had reopened its voluntary severance and early retirement scheme. It reads: "Over the coming months, we will focus our efforts on working with staff, partners and the community to secure a sustainable financial foundation on which we can build a prosperous long-term future for our historic university." Jeff Baker, from Unison, said: "Aberystwyth University is the major employer in west Wales and, undoubtedly, this will impact on the local and regional economy. "We know the university has serious financial problems. "This is a result of a series of poor decisions taken by the senior management over a number of years, the drop in student applicants from the UK and abroad, and the fact that more potential students are opting to stay at home." He said the union would work with the university to identify potential savings. In March, the University of South Wales said up to 139 jobs could be at risk as it tried to balance rising costs with an anticipated reduction in students due to Brexit.